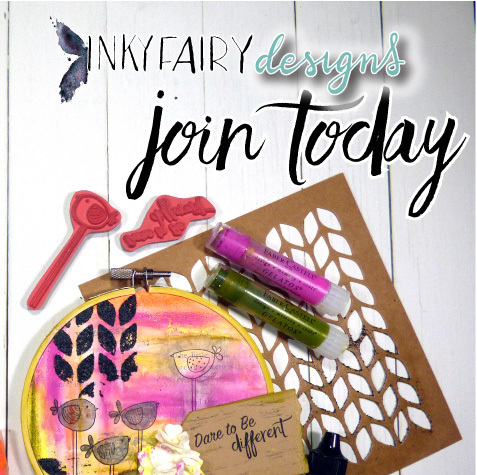 Inky Fairy Designs: Introducing the Mixed Media Kit Club! Introducing the Mixed Media Kit Club! Hi everyone! I am thrilled to announce a new kit club focused on mixed media that will begin shipping next week. You can sign up today HERE. I envision this as a way to learn all about mixed media for the curious as well as to jumpstart your creative spark if you've found yourself in a creative funk. Teaching and inspiring others with my art is my passion and I thought this would be a great way to get some of my favorite products into your hands each month and not just that I want you to put those awesome products into use right away with full step by step online video tutorials where I will give you tips and ideas for each product as we work through to a finished project. You can also join the Inky Fairy Designs Kit Club Facebook group for sneak peeks on upcoming kits and share your projects created with the kits! Check out this cute little video explaining more about how the kit subscription works as well as a special discount! The first kits will be shipping out NEXT week and these are going to sell out fast so join me in signing up today!! I can't wait to see what you guys create with them. Sounds like a wonderful kit and program! !